It is raining multi-starrer films in Bollywood and we aren’t complaining. With mega-budget films and ensemble cast, production houses and filmmakers are bringing back those multi-starrer big movies back for the audience. With Karan Johar’s Takht, Abhishek Varman’s Kalank, Ashutosh Gowarikar’s Panipat, it seems like Anurag Basu is also joining the bandwagon of an ensemble cast. It has been rumoured that Anurag Basu is planning Life In A Metro sequel and has reportedly locked in the cast for the same. A source close to the Anurag Basu’s next project has revealed that it will be a great blend of different actors coming together. 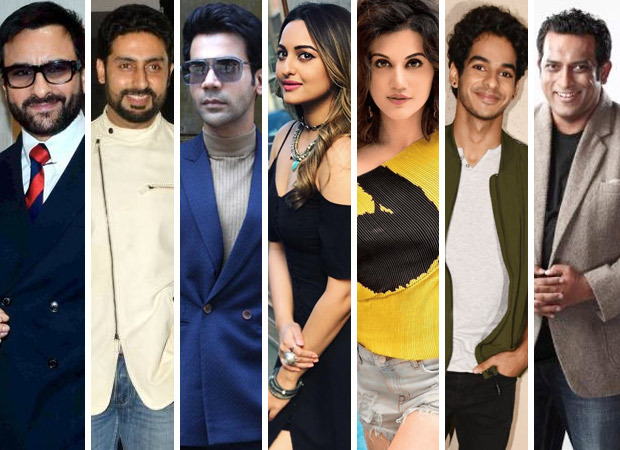 From what it has been learned, the star cast of the Anurag Basu’s next includes Saif Ali Khan, Abhishek Bachchan, Rajkummar Rao, Sonakshi Sinha, Taapsee Pannu and Ishaan Khatter in the lead. Furthermore, the makers are currently on a lookout to rope in another actress for the film. Besides this amazing casting coup, the film will reportedly have music by Pritam who is currently on hiatus after Jagga Jasoos. Adding to that, Bhushan Kumar’s T-Series has reportedly come on board as the co-producer for this untitled film. The 2007 film Life In A Metro was also multistarrer with the names like Kangana Ranaut, Konkona Sen Sharma, Shilpa Shetty, Nafisa Ali, Dharmendra, Shiney Ahuja, Kay Kay Menon, Sharman Joshi and Irrfan Khan. Interestingly, Saif Ali Khan and Abhishek Bachchan have previously worked together in LOC Kargil and Hum Tum. It will be pretty interesting to watch them come together on the big screen again. Besides, Abhishek will also be seen with Taapsee in Manmarziyaan which is releasing this month. On the work front, Anurag Basu last helmed Ranbir Kapoor and Katrina Kaif starrer musical dramedy Jagga Jasoos. The film wasn’t a box office success.